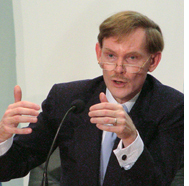 Will Robert Zoellick make a better World Bank president? Even as uproar over Paul Wolfowitz' conduct as the World Bank (wb) president is subsiding, the us's nominee for the next president is causing familiar controversy. us President George W Bush nominated Robert Zoellick as the next wb president introducing him as a "committed internationalist, deeply devoted to the mission of the wb. He wants to help struggling nations defeat poverty". Critics say Zoellick has many challenges ahead of him, beginning with regaining the trust of the international community following the Wolfowitz scandal. To rally support for his nomination, Zoellick is at present on a two-week whirlwind tour of the world starting in Ghana, where he reached on June 5. From Ghana, Zoellick will travel to some other African countries and then to Europe and South America. Zoellick served at the treasury under president George Bush Sr and under the present president as us the deputy secretary of state and special trade representative. A strong advocate of free trade agreements, Zoellick represented the us in the Doha round of World Trade Organization talks, precisely what critics hold against him. They are sceptical especially in view of his corporate background as a senior executive of the investment bank Goldman Sachs and as a board member of Enron, the now defunct energy company. "Zoellick has been close friends with brand-name pharmaceutical industries, and the bilateral trade agreements he negotiated effectively block access to generic medication for millions. As an early backer of us military action in Iraq, and a former paid adviser to Enron, Zoellick brings significant baggage with him," said Paul Zeitz, executive director of the Washington, dc-based ngo Global aids Alliance. Joseph Stiglitz, former chief economist of the wb, also questioned Zoellick's credentials. "Zoellick defended American agricultural protectionism until the bitter end when he was responsible for commercial talks. How will he, as the future wb president, ask for the dismantling of aid to agriculture that favours developed countries at the expense of the poor?" Zoellick's nomination by the us president has also fuelled the old debate regarding the us's right to nominate the bank's head (see 'Too opaque for comfort', October 31, 2005). "This is an opportunity to initiate meaningful reforms starting with an open, democratic and merit-based process for choosing the next president," said Bruce Jenkins, acting executive director of Bank Information Centre, a pressure group. The head of the wb is traditionally an American chosen by the White House. With Zoellick the only candidate until now and with support from countries like the uk, Germany and France, there seem no hurdles in his path. Nominations are open till June 15. "The public must not accept a candidate hand-picked by the us. If other countries allow the us nomination to go ahead unchallenged, they will be complicit in the continued poor governance of the institution added Jenkins. The selection of the president of the 185-member wb has to be approved by the bank's 24-member board.